What a wonderful time of year to remember how rich we are because Jesus Christ came to earth to be our Savior, and we are united in Him! “All praise to God, the Father of our Lord Jesus Christ, who has blessed us with every spiritual blessing in the heavenly realms because we are united with Christ.” Ephesians 1:3 We pray that you will be filled with praise and thanks to God for His Gift during the Christmas holidays and all year long! Grace’s Wedding Our daughter Grace married Ward Bearden on November 14th. It was a glorious time centered on our Savior! Grace and Ward share the same purpose in their marriage, to seek first God’s kingdom in all that they do. Please remember to pray for them as they need God’s strength to grow in this new relationship. Thank You! We thank God for your friendship and partnership in the gospel of Jesus Christ! We greatly appreciate each of you who give regularly and/or pray for our ministry; it is indeed a team effort. Please prayerfully consider supporting us with a special year-end gift to enable us to continue working in Ukraine to spread the gospel and make disciples. If you desire to do this, make your gift out to Great Commission Ministries and mail it to the address below. You may also give on line if you prefer. Thank you again for your love for God and people that enables us to serve overseas. We included a page of testimonies of the men and women in the rehab centers who we are serving. Their lives are changed forever because of God’s grace. Enjoy! 1. Our remaining time in America with our family and friends to be eternally profitable. 2. Steve’s teaching at Faithwalkers December 27-30. 3. Our financial support to remain strong and for year-end giving. Thank you! Not everyone has the courage to look into their heart and honestly admit - this is who I really am. How many of us have things we will not tell our friend or even admit to ourselves? I realized that my selfish desires (more accurately - lust) will never be satisfied, I will never have enough, and most importantly - I'll never be happy pursuing addictions and selfishness. This state of addiction, which everyone experiences in someway in their life, leads to depression and emptiness. I finally dropped my hands and knew there was nothing else to do, but to turn to God. I thought - if you are really depending on Him, then everything is up to Him. Now I'm at the rehabilitation center and I am immensely happy! I thank my God that He gave me wisdom to make the right decision and I pray to Him, so that noone and nothing could separate me from Him! My name is Volera, and I have lived all my life in Kiev. I was the third child born in a typical family when my Mother was 41 years old. Mom and Dad worked all the time, so basically I grew up on the street. At the age of twelve, I was already registered as a juvenile delinquent. I was stealing, drinking alcohol, and smoking cigarettes. Soon I started using marijuana, then it was on to hard drugs and I became a slave to them. For a couple of years my sin was covered over in beautiful wrapping: going to interesting clubs and bars of all different sizes. But then reality set in. I alienated my loved ones by deceiving and lying to them. There were numerous scandals, sickness, many tears, and eventually imprisonment. I was disappointed in everything: in my choices, in my beliefs and, of course - in life. There was no point to my life- no purpose, no joy, and no peace. Instead, there was only a vast emptiness, and all of this because of the deceptive beauty of sin. I buried a lot of my friends, acquaintances, as well as my elderly parents. I realized that all I was doing was a dead end. I was totally broken, lonely, and no one needed me. I had nothing and I did not want anything. So I came in brokenness to God. I was able to get into a rehab center and it was the happiest time in my life. All this time I stayed at the feet of Jesus Christ. He has blessed me with a whole hearted devotion. And now my whole life and all my time belong to Him. I now serve God in one of our rehabilitation centers. I realize there is no greater purpose to life than helping people to find and know Christ. I am a very happy man because of His mercy and love for me. To Him be all the glory and praise. My name is Maxim, and I am thirty-one years old. Thirteen of those years, I was hooked on alcohol and drugs. One night I realized that I had no way out, and I asked God to change my life and help me to regain the trust of my parents and my family. I promised I would serve Him if this occurred. My name is Sasha, I am 47 years old. I was an alcoholic and drug addict. I filled the emptiness in my heart with vodka, drugs, and women, but it did not help me to find true joy. Then in 2009, Christ came into my life. I cannot explain in words how Jesus has set me free. After 32 years of smoking, in one fell swoop the Lord delivered me. And in the same way, the Lord delivered me from the rest of my idols, which were very many. The Lord cleansed my heart from all defilement, and replaced it with His love. Now I gladly yield my heart to Jesus and will serve the Him until I enter eternity! My name is Lena, and I am 21 years old. It was not long ago that I was depressed, not sure about anything in life and only interested in sin. I'm not sure you can even call what I had life. I was totally lost in this world. I was addicted to drugs for over four years. In my heart there was a void, which I tried to fill with drugs, alcohol and other artificial pleasures. This feeling led me to despair. I turned to my faithful friend, who had been freed from drug addiction and lived with God. And after listening to his advice, I went to the rehab center. When I went, I did not know where I was going and what was going to happen. I was very scared and worried. The first days in rehab were very difficult, and many times I wanted to leave. But, thanks to the prayers of the sisters, brothers, and, above all the Lord, I stayed here. God really changed my life and my heart. I asked forgiveness for my sins before God and received him into my heart as Savior and Lord (ie, gave my entire life into his hands). And He gives me many miracles and great joy! He fills my heart with His love. I thank God that He loves us as we are. I thank Him that He extends a helping hand when it seems that everything in life is over. Friends! I beg you, turn away from sin and cry out for help to God. He is sure to help! Give your problems into His hands and He will bear you in His arms! Recently I noticed how Paul often referred to his fellow Christians as “workers” in the gospel. That is what we are too! We are working in God’s fields, the harvest of souls. Jesus Christ is building His church, and He is using us, His workers! Last month we asked you to pray for, “the believers we work with to have a greater passion for the lost.” God heard and answered your prayers! Here is a beautiful story about how He used a young Ukrainian mother’s hardship and pain to have a greater passion for the lost. Our friend Alisa’s invalid grandmother had Alzheimer’s. The total responsibility for her care was thrust upon her, because Alisa’s mother was unwilling to care for her own sick mother. Therefore, Alisa’s grandmother lived with her family in their small apartment in Kiev. All through her pregnancy, and later caring for her newborn baby, she fed, bathed, and cleaned up after her incontinent grandmother. Alisa struggled with the situation, but more often than not, she sacrificed her life in the power of God’s Spirit to love her grandmother. Alisa was an amazing example of Jesus’ love! Her grandmother died a few weeks ago in her husband’s arms as they were bathing her. How could God use such a tragic situation for His purposes? He changed Alisa and her husband’s character, refining and purifying them daily as they sacrificed. Then, a few days after the funeral, a friend of Alisa’s called her out of the blue. He asked her how she was able to care for her grandmother for all those years. She told him it was all because of God’s grace. Then, she powerfully shared the gospel with him! Where did this power come from? It came from walking with Christ daily, trusting Him for the grace to serve her grandmother. Since she had her mind on eternal things, she was ready to speak about salvation to her old friend! Her example reminded me of this verse from 1 Peter 3:15 “but sanctify Christ as Lord in your hearts, always being ready to make a defense to everyone who asks you to give an account for the hope that is in you, yet with gentleness and reverence.” I think we should all ask ourselves, “Is Christ Lord in my heart?” and, “Am I ready to give an account for the hope that is in me?” Alisa’s example speaks a powerful “Yes!” to me! Pray for each of the believers in Ukraine we have worked with to be devoted to God’s word daily, learning how to build each other’s faith, and be powerful witnesses of Christ. We return to America November 1st for our daughter Grace’s wedding November 14th. We thank God for her fiancé Ward Bearden. Please pray for them to start this new marriage with a strong dependence on God and love for others. Pray for us to have an encouraging and fun time in America with our family and friends. We hope to see many of you! Please pray for Steve as he speaks at the Faithwalkers conference in Asheville, NC right after Christmas. We thank God for you! Happy Thanksgiving! In this photo I am running on one of the many trails in the forest near our apartment. Danelle and I frequent these trails to run and pray and ask God to change lives. Paul traveled to Rome to preach the gospel, “That is why I am so eager to preach the gospel also to you who are at Rome.” Why was he eager to speak about Jesus Christ’s death and resurrection to them? Paul knew the gospel’s power to save and give a sinner new life. “I am not ashamed of the gospel, because it is the power of God for the salvation of everyone who believes: first for the Jew, then for the Gentile.” Romans 1:15-16 We moved to Ukraine to preach the gospel of Christ to all who will listen. Here are some recent stories about how the gospel is changing lives in Ukraine. God led us to the “good soil” Jesus spoke about – people who know they are sinners, and want God’s power to change. Last spring we were in Dimitrov, where we met a young Christian and told her about our Rehab Centers in Kiev. She had a Christian friend, Natasha, whose husband Maksim, was an alcoholic. Shortly after that he went to the rehab center and his life was changed. A few months later Natasha’s mother, Sveta, became one of the first women at the newly opened Women’s Rehab where she too committed her life to Jesus. Maksim and Sveta are pictured above (in brackets), were baptized with 11 others! Several weeks later Spring of Hope Church baptized three people. Dima, pictured on the left, is the young lawyer who helped us share the gospel at the sports camp this summer. We’ve had the pleasure of seeing him take steps of faith to share his testimony at camp, and now to follow Christ in baptism. 1. For those who were baptized to grow in God’s grace and lead others to Christ. 2. For God’s wisdom on how to prepare those in the rehab centers to transition into society. We trust that you are walking with God and receiving His abundant grace to do His will. He has provided abundant grace to us this month to keep serving, even with the record temperatures almost daily reaching 100 degrees. We are so looking forward to the fall! We have been actively making disciples, serving the men and women at the rehab centers, attending small group meetings, and devoting ourselves to fervent prayer for needs here and for many of you. Recently, we attended the wedding of two of our close friends. They both love the Lord, and will be a good example of a Christ-centered marriage in a country that so desperately needs good role models. In the photo is the new couple, Vitalic and Oksana Rizol, with Pastor Maxim Nicolaev, who conducted the ceremony. Yes, they got married on a dock on the Dnieper River on a sunny afternoon in August! Umbrellas and water bottles were essential fare to survive the hot, hour-long ceremony. It was a beautiful wedding, and Maxim shared some excellent Biblical truths that touched all our hearts. 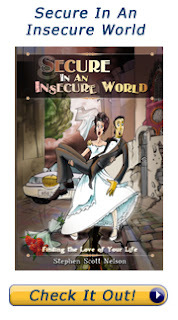 Maria, a businesswoman in Kiev, read Steve’s book, Secure In An Insecure World (in Russian of course), and loved it so much that she asked us to lead a marriage seminar next month. We will use Steve’s book as a supplement to the four training times at Maria’s Christian Singles Club, in hopes that many unbelievers will come and hear the gospel. We will have discussions about the need for love, respect, and trust in relationships. They will hear how Jesus Christ loves them, can forgive their sins, give them new life, and make them complete and content. 1. How to help the Rehab Center graduates successfully transition to normal life & grow. 2. Discipleship Conference Sept. 17-19 in Kiev. Several countries will be represented. 3. GC Europe Conference Sept 23-25. Pastor Doug Brown from Kansas City will teach. 4. Marriage Seminar Sept 8-15. People to be saved and begin Christ-centered marriages. *Please view the Running to Win video, if you have never watched it before, or want to watch it again. The link is located on the left side of the page. Danelle and I just returned from leading a week-long sports camp in Dimitrov, a poor mining town in eastern Ukraine. The local church invited us to work with them in this outreach to the youth. Not only did dozens of teenagers and adults hear about the Lord Jesus, but God strengthened our relationship with the church there. He also did some transforming work on our character as well. The living conditions were, let’s just say, rather Spartan! David Henson, a fellow GCM missionary, participated, as well as Dima Gusar (in the yellow shirt), a young Ukrainian lawyer. This was Dima’s first mission trip, and he said he was thrilled to share the gospel for the first time. Andris (in black & red shirt), a young man from Latvia, was staying with us in Kiev, and then he traveled with us to Dimitrov. Andris had come to observe what God is doing in the Ukrainian churches and serve where needed. He said after the first day in Dimitrov, “I think God has me here to learn to live outside of my comfort zone!” We all felt that way during the week in the heat, with only very cold water available from 6-10 in the morning and evening, sometimes not even that. And there was only one “shower” (I use the term loosely) in our entire four story dormitory! Danelle happened to be reading in the book of Job that week and I told her to stop! :-) Today she shared James 1:2-4 with me. Here is the Message translation, “Consider it a sheer gift, friends, when tests and challenges come at you from all sides. You know that under pressure, your faith-life is forced into the open and shows its true colors. So don't try to get out of anything prematurely. Let it do its work so you become mature and well-developed, not deficient in any way.” We trust that God will bear much fruit for His glory from our being “under pressure” for the gospel. Please pray for Igor and the church there. Our recent time in America was very encouraging because we saw many of you. Steve was able to attend the installation of his brother Kurt as President of East-West Ministries in Dallas. We both traveled to Omaha for the Great Commission National Pastor’s Conference, where we enjoyed catching up with old friends. We were refreshed through by being with my mother and our children and their spouses, as well as our grandchildren. We attended Stephanie’s graduation from the University of Georgia and Grace’s graduation from Shorter College. We were also blessed to be present for the birth of our grandson, Ezra Lydon Stansell, on June 6th. Ezra is growing so quickly that he will be entering his first Peachtree Road Race in just a few years! Finally, Grace became engaged to Ward Bearden, and they will be married November 14th! We thank God for Ward and how He led them to serve Him together! 1. Danelle and I will travel with Timmy and Kenyon to Odessa July 23-25 to teach and encourage the believers. 3. For God’s wisdom on how to prepare the men in the rehab centers to transition to life, work, and family situations. 4. We will open a women’s rehab center. Pray this would be effective and life-changing. 5. The youth in Dimitrov who heard the gospel to get saved, and the church to love them. Pray for Vitalic, Natalie, and Artom in particular to trust Christ. * Please go to my Facebook page if you wish to see more pictures from our outreach in Dimitrov. Wow, what a crazy time of travel and ministry we have had over the past two months! I honestly don’t know how Jesus and His disciples did it. They walked everywhere! At least we traveled by train, car, or bus to cities in Ukraine, Moldova, and Romania. Jesus and His disciples walked about 25 miles one morning to Samaria. The Scripture tells us in John 4:6, “Jesus, tired as He was from the journey, sat down by the well.” Of course He was tired! But, the beautiful thing about Jesus was that He always thought about others as more important than Himself, even when He was tired and had nothing to eat. Because of this love, He shared the gospel with a Samaritan woman under these challenging circumstances! Remember, Jews did not associate with Samaritans! When His disciples returned with lunch, They were amazed to see Him speaking with a Samaritan and a woman. He said, "My food is to do the will of Him who sent Me and to accomplish His work.” John 4:34 Jesus’ food was doing the will of God, it energized Him! What was the will of God in this context? It was caring enough to show respect to this sinful woman, and tell her how to find living water! He met her deepest need – for love and forgiveness! This is the way we have felt during our travels recently, honored to take the gospel to the thirsty, hurting and lonely. Timmy and I have traveled to numerous cities to help new house churches and share Christ whenever possible. We are thankful that our wives joined us in this ministry on several occasions. Yes, it has been physically exhausting, but spiritually we have been well fed. Our souls were satisfied by doing His work. My uncle Dave recently told me about a Romanian student, Razvan, who he met on the internet. He suggested I contact him by e-mail, which I did. Timmy and I were taking a trip to Moldova to teach a conference. We were going to be relatively close to Lasi, Romania (pronounced Yash), where Razvan lived, and so I prayed about God giving us an opportunity to meet him. Timmy and I traveled in a public van 3.5 hours to meet Razvan and his friend Tudor. We had a wonderful time getting to know them, their city and country. They were very kind and gracious to show us around for several hours. While we ate on the 15th floor of a hotel, looking out over the entire city, we shared with them how Jesus Christ changed our lives, how He loved them, and how they too could know Him. They were very open and we had a great discussion. Please pray for God to show them the difference between religion and a personal relationship with Him through Christ. They told us there are 50,000 students in Lasi, and most of them speak English. They also said they did not know of any Christian ministry at these universities! Pray for any future work God may have for us in Romania. We will be in the US for 6 weeks for the graduations of our daughters Stephanie and Grace from college and the birth of our grandson, Whitney and Micah’s first child. Quality time with our seven children, spouses, other family members, and friends. For Whitney to have a safe delivery and healthy baby. We would know God’s plans for possible trips to Kharkov & Russia when we return June 19th. We will go to Moldova for a Simple Church camp July 4-9. Pray for wisdom in preparation for teaching as well as God’s leading in bringing who he wants to be there. Effective transition of the new believers at the Rehab center to normal life. Recently, we opened a 2nd center. Praise God for the 25 men have come to Christ in the past 18 months! Pray for plans to open a women’s center. Ask God to save Razvan, Tudor, and many of other Romanian students. Please pray for any future involvement in Romania. This month we decided to do something different. Danelle recently wrote two devotionals for Faithwalkers based on our ministry in Ukraine. We thought you would enjoy them! It is hard to believe that we have lived in Ukraine for nearly 5 years! Our first two years were spent intensely studying Russian with our teacher, Galina. During our first year of class, Galina’s father died suddenly, leaving her as the only caretaker for her invalid mother. Galina’s mother was very unhappy and difficult, and demanded her constant attention. God had given us a special love for Galina, and she for us, but her circumstances motivated us to pray for her even more. While we knew it was likely that we would rarely see each other after we finished our two years of Russian, but we knew we would always be friends. Many times we spoke with Galina about God’s loved for her personally; about Christ’s death on the cross for her sins. Although she was interested, she wasn’t ready to make a commitment to Christ. And so, it was with great joy that we recently received the news that Galina had become a Christian. We went to see her last week, and we all cried and laughed as she told us her story. She said, “One day I was complaining to myself that I was all alone and without hope. Then I heard God’s voice in my heart say “Who’s alone? I’m with you! !” At that moment I knew it was true and I gave my life to God.” While we weren’t the only ones who shared the gospel with Galina over the years, she said our love and care, and discussions about salvation by grace, were a vital part of her decision to become a Christian. A young lawyer named Sasha attended one of our English clubs. Many times we would weave the gospel through our lessons. Sasha even met with Steve privately a few times to ask questions about how to know God, but like Galina, he was interested, but not ready. That is until his roommate had a dream in which Sasha died. Sasha took it to heart, and realized that if he had died, he would have gone to hell. At this point he started to reflect on the things Steve had shared with him about having a personal relationship with Jesus Christ, and immediately decided to trust Jesus as his Lord and Savior. Sasha has continued to grow as a new follower of Christ. Just last week he and Steve had lunch together, because he wanted to learn how to more effectively communicate the gospel with his family. As I have reflected on our afternoon with Galina, and Steve’s lunch with Sasha, I am reminded that these times are just a sneak preview of what heaven is going to be like. We will see people that we have shared Christ with who later became Christians, but we never knew it! Or we will see others we have lost touch with who have continued to be faithful and obedient to Christ. In heaven we will be able to hear all the stories when we meet together again! Our hearts will be exploding with so much joy and happiness that we will barely be able to stand it! Finally, when I think of people like Galina and Sasha, it motivates me to notice the people around me and recognize they ARE either going to be in heaven or hell. God will use every instance that we show love to someone, take a risk, and tell them about Jesus. We may see the results on this earth – or maybe not until heaven! Therefore, let’s sow bountifully! Our trip to Odessa April 21-25th to train the new house churches. Our trip to Moldova April 30– May 3 helping with house churches. Wisdom to help City on a Hill church here in Kiev, & the group meeting Tuesday night. Wisdom about a sports camp here in June, & simple church training in Moldova in July. Effective transition of the new believers at the Rehab center into ministry in normal life. We just opened a 2nd center. Praise God for the 25 men have come to Christ in the past 18 months! Continued health & a safe delivery for our daughter Whitney & our new grandson, who is due in early June. 3 New Churches in Odessa God has led Timmy Powers and I to be more involved in starting new churches outside of Kiev. We believe He wants us to be more catalytic. Recently, we took our second trip to Odessa to help three new house churches. Misha, Gennady and their wives are leading these new works. Lately, they have been sharing the good news with people in the hospital. Good men! We plan to return with our wives March 5-7. Please pray for God to lead us during this time. Baptism of 7 New Believers It was a joy to see these new Christians celebrate their new life by being baptized, especially because we know them personally, and we have been praying for their salvation! Bagdon is baptizing Oksana, one of the orphans living at Safe Haven, where Bagdon & Anya are the house parents. Trip to Dniprodzerjenck (Easy for them to say!) Timmy and I just returned from…yeah, that place. Victor, a local pastor, invited us to come encourage the church, and the students at their mission school. He shares our desire to start new churches- they have already sent out missionaries. I was able to speak with the students about relationships, and how to be secure in God and His love. One young man poured out his heart to us afterwards. He expressed his deep gratitude for the teaching and our time with him. Sports Camp - June 25-July 4 This camp is to build relationships with teenagers, and to share Christ with them in a variety of ways. If you are interested in coming to help, please contact me. We need you! Misha & Gennady, as they lead the new house churches in Odessa. Timmy, Kenyon, Danelle & I as we travel March 5-7 to serve in Odessa. Wisdom and grace to effectively train disciples all over Ukraine and beyond. For our future ministry of starting new churches with Victor in Dniprodzerjenck. New Year… New Decade… New Hope… New Love! There can be something inspiring and spiritually healthy about a new year. It gives us an opportunity to evaluate our lives; what we have done, and what we want to change - a fresh start. I just finished reading Jeremiah’s prophecy about the Lord’s judgment on Judea and Israel for their rebellion. It was a depressing and hopeless time for God’s people. Then, on January 1st, I read Lamentations 3:21-24, Yet this I call to mind and therefore I have hope: because of the Lord's great love we are not consumed, for his compassions never fail. They are new every morning; great is your faithfulness. I say to myself, "The Lord is my portion; therefore I will wait for him." The Lord has a great love for you! His compassions toward us never fail – they never stop! May we all trust in His unfailing love every day of this New Year. I encourage you to remember this and rest in His love every morning! We thank God for making it possible for our daughters, Merry and Grace, to be able to come to Kiev for Christmas. We enjoyed many hours together in our apartment, attending house church, walking in the snow-covered forest, taking in The Nutcracker at the opera house, and running together. They were able to reconnect with their high school friends on many occasions as well. Danelle and I have been encouraged by the openness and desire to grow among our house church friends. These men pictured here are all young professionals, and the girls are former orphans who are presently enrolled at the university. Please pray for them by name to embrace God’s vision for reaching the lost and making disciples in Ukraine. Pray for us to love them unconditionally, understand their needs, and build their faith. God brought 150 people from all over Europe to Spain for the 2010 Awaken conference. The theme was 24/7 Life in the Kingdom. We heard stimulating teaching, had practical workshops, and had rich fellowship together. I had the privilege of teaching one of the main sessions on How to be People of Influence, as well as leading a workshop on Preparing for Marriage. Our faith was strengthened by believers from all over Europe who also want to influence their world for Christ. Thank you for praying for us! Please pray for us as we work with Timmy and Kenyon Powers to begin new house churches and strengthen existing ones in Odessa and several other cities in Ukraine. We will be taking extended trips to train believers in Ukraine and Moldova beginning the last week of January. We need God’s grace. We want to see God make many disciples who will commit to reaching others with the gospel. Thank you to everyone who gave a special gift at the end of last year. Thank you to all of you who give faithfully each month. Thank you to everyone who remembers us in prayer before God! We are sustained by your efforts of love. May God bless you as you live 24/7 in the Kingdom!